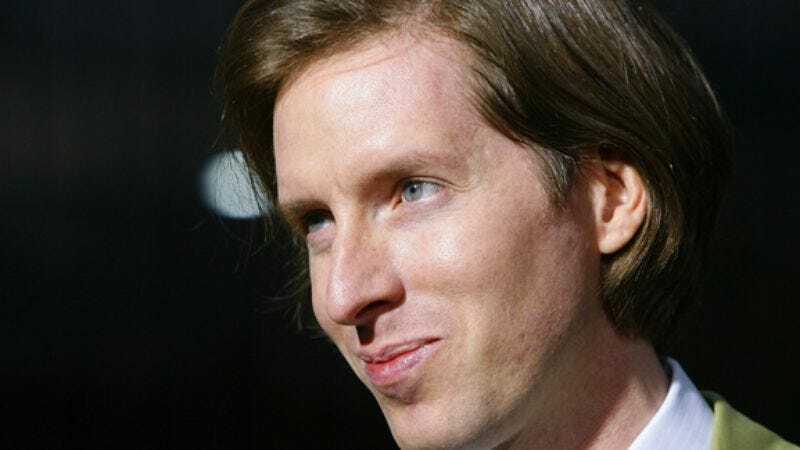 In 1996, a 26-year-old filmmaker from Houston named Wes Anderson—working with his best friend Owen Wilson and Owen's brother Luke—finished his debut feature film, Bottle Rocket, a stylish, laconic story about crime and sentimentality. Though it initially received mixed reviews, Bottle Rocket has gone on to be recognized as one of the most significant debut films of the '90s, and Anderson has become one of the most recognized names in contemporary American cinema, even though his films—The Darjeeling Limited, The Life Aquatic With Steve Zissou, The Royal Tenenbaums, and Rushmore—annoy as many people as they delight. As The Criterion Collection prepares to make Bottle Rocket part of its first wave of Blu-Ray releases, Anderson spoke with The A.V. Club about on-the-job training, being despised, and what debut films he admires most. The A.V. Club: Have you watched the documentary about the making of Bottle Rocket on the Criterion DVD? AVC: Is that something you enjoy? Hearing other people's recollections about an experience you all shared? WA: Not really. [Laughs.] But with that one, it was nice to see some old friends. Usually when you're looking at those things, you're just worried that some awful, embarrassing thing is going to come up. But the Bottle Rocket one is mainly quite pleasant. AVC: Was there anything that surprised you? Anything your friends recalled that you don't recall the same way? WA: Yeah, a couple things. It sounded like some of the people thought I was out of my mind. [Laughs.] I probably was. AVC: One thing that's said over and over is that you seemed to have a clear vision for what you wanted, even when everybody around you was baffled. Did you ever feel that you were in over your head? WA: I did not feel over my head. You know, Owen and I had written something that was ours, that was very personal to us, and so we probably shouldn't have been surprised that it didn't immediately reveal itself to everybody. But on the other hand, I think most of the people working on the movie did get what we were after. Certainly [producers] Jim Brooks and Polly Platt did. Even though Polly on the Criterion documentary kind of seems like she thought I was a bit crazy, Polly really always did understand the movie, I thought. And Jim saw the script and the short we did of Bottle Rocket, and he was the only person in the world who was actually prepared to put money behind it. So I don't know. AVC: Do you think James Caan got it? WA: Yeah, kind of. [Laughs.] James Caan, I think… One thing I began to realize when we started doing that movie is that Owen and Luke and [co-star] Bob Musgrave and I, we had our own way of working together. We'd been doing our own experiments, and I'd been making my own shorts, and as we started making Bottle Rocket with other people, I began to realize, "I think the way we're doing things is not quite right, because some of our techniques seem to be getting sort of a puzzled reaction." Just the order in which we were doing things sometimes was unusual. On practically every close-up in the movie, I never set it up where the actors could actually see each other. They always had to look at a little piece of tape, which isn't completely unheard of, but usually directors figure out a way that the actors can look at each other even if someone's offscreen. By the time James Caan got there, it was all tape, and I remember him being just, "Why is this happening?" And I remember I thought, "Yeah, you know what, maybe there's a way around that." There were quite a few moments like that. One of the guys I cast was Caan's karate sensei, whose name was Tak Kubota, as a character in the story named Rowboat, his right-hand man. And I remember that we had a scene where they were supposed to be doing some karate together, and we had Tak in just Fruit Of The Loom briefs. Caan came in and was really thrown by that. I was saying, "Well, I think it's going to be funny," and his reaction was, "This isn't supposed to be a comedy, is it?" [Laughs.] But I think he was amused by it. He wasn't there for long, and we had fun with him, and he seemed to be getting a laugh out of it all. AVC: Do you still work in such an unconventional way? There were rumors that on The Royal Tenenbaums, Gene Hackman was bemused by the way you were working. WA: No, Gene was definitely not bemused. [Laughs.] In fact, by then I'd had some experience with well-known actors, and with Gene, I more or less tried to do what he wanted to do. But Gene, I don't think loves being directed in the first place, and I had a lot of particular ideas for the way some things were to be done. He just wasn't getting a huge kick out of it—but I don't know that he ever does. The main thing is that everything he was doing was great. Even though he can be belligerent, there's a lot of emotion there. I was always excited to be working with him, even when I was a little scared of him, just because this character that I'd spent so much time working on and was so invested in was being brought to life—not only in all the ways that I'd wanted, but something quite beyond. AVC: Were you steeped in Hollywood lore as a kid, to the point where you would feel somewhat reverent to a Gene Hackman or a James Caan? AVC: What about Polly Platt, who's legendary on the business side? Did you keep up with the business side of show business? WA: I don't know about that, but I definitely knew who Polly was. The Last Picture Show was a movie that was particularly important to me, and one of the few films that I always felt especially inspired by, so that was a name that meant a lot to me. AVC: Did growing up in Texas have anything to do with your attraction to The Last Picture Show? WA: I suppose it did. I mean, Larry McMurtry's a Texan. But I don't think my experience of Texas was close to that. I grew up in such a different environment in Texas. I just think that movie's so well-written and well-played, and the cast is not a Texan cast, except for maybe Randy Quaid. But [director] Peter Bogdanovich is somebody who comes from New York, and loves the theater. I probably related to it more in that way, though I'm not even sure what way that is, exactly. AVC: Do you think of yourself as a Texan? Aside from Bottle Rocket, Texas hasn't really been a part of your movies. WA: Well I do, but I wouldn't say that I know exactly how. You know, Rushmore, we made in Houston. I like Westerns, but I don't know if that's something particularly Texan either. That's more Hollywood. AVC: The original short version of Bottle Rocket, which is included on DVD, almost feels like an excerpt from a longer work. Was the script always feature-length before you made the short? WA: Yeah, that short was supposed to be just an installment of the feature. But it's probably just as well that we started over. We actually shot more. The short has quite a bit of stuff that was cut out of it. I think at one point it was more like 30 minutes or something, and we cut it down. I tried to find all that footage to put it on the DVD, but it never turned up. My mother was looking through closets and searching everywhere, and we just never could find that stuff. AVC: Had you wanted to shoot in black and white? Was that always part of the plan? WA: Uh-huh. And I wouldn't be surprised if some of that came from The Last Picture Show, being a movie in black and white at a time when movies weren't. AVC: So why the change to color? WA: Well, the change to color came when somebody actually wanted to put some money in it, and they said, "Well, you can't do it in black and white." [Laughs.] So that was a good motivation. But the other thing is that by the time we were shooting the movie, I had ideas about the palette the movie was going to have, and how we'd use that. So by the time we were doing it, I was very excited about working in color. But at first it was meant to be black and white, like classic Hollywood movies and also, in particular, French New Wave movies. Also Last Picture Show and that Bruce Weber documentary Let's Get Lost. Those were the movies in particular that were making me want to shoot in black and white. AVC: Do you have any desire to make a feature in black and white at some point? WA: Yeah, I would love to do that. AVC: But no immediate plans? WA: No, not at the moment. AVC: Around the time Bottle Rocket came out, there was a whole wave of indie crime films. Were you trying to react to that in any way, or to capitalize on it? Or was it just coincidental that Bottle Rocket fell into that genre? WA: I don't know that it was coincidental, because I have a feeling that a lot of those movies that you're talking about were inspired by Martin Scorsese. I think we all had Mean Streets and Goodfellas in mind. For me also, it was Shoot The Piano Player, a genre movie—a crime movie—that François Truffaut used to sort of talk about himself and his friends. He made this strange mixture. I think a lot of† the new filmmakers around the time of Bottle Rocket might have had a lot of similar inspirations. And Quentin Tarantino was an inspiration to lots of people, because he has such a strong voice and was so successful all of a sudden. He had a big impact. Though I guess he was inspired by Asian crime movies as much as anything. AVC: And Scorsese. And Brian De Palma. AVC: The generation of filmmakers that emerged in the '70s—Scorsese, De Palma, Steven Spielberg, George Lucas, Francis Ford Coppola—were all friends. Do feel like you're part of a group the way they were part of a group? AVC: Speaking of Los Angeles, in the documentary on the Bottle Rocket DVD, you mention that you spent more than a year there working on the script. What was it like to move from Texas to L.A. and spend every day driving to a studio to work in an office? Was the whole business side of Hollywood seductive at all? WA: No, not seductive. We were there really desperately trying to get our movie going, because we were very conscious of the fact that it might fall apart. It always seemed like it was about to. It's hard to get even a little movie like ours made, because it's still millions of dollars you're talking about. It didn't even need to be millions of dollars, but it was. And getting that thing going took a lot of time. So it wasn't particularly seductive, but it was exciting to go to a movie studio. I worked in Rome at Cinecittà on The Life Aquatic, and that was very fun, but other than that, I've never had an office on a studio lot. And that was great. It was great just to be given a pass to go on the lot in the first place, much less to be there working on our script and doing our casting sessions and all that stuff. It was a good introduction to the organization of how movies get made. AVC: Were there any opportunities to do any other kind of work while you were out there? Did anybody at Gracie Films ask you to rewrite other scripts, or to work on anything else for them? WA: No, that didn't happen. We were just trying to get this one thing done. Also, I don't think anybody else there was even thinking about us. AVC: Again according to the documentary, you had to fight hard for certain things, and didn't always get your way. Are you generally happy with the choices that were made both in the cutting of the script and in the cutting of the film? WA: It's kind of hard to even gauge that, because I think the movie we originally made probably didn't work. There was a renovation process that took place. Making that movie, and in particular working with Jim Brooks, was a bit of a film-school experience for me and Owen, both when we were writing the movie and in particular in the editing room. We spent a lot of time trying to get the movie to work properly. Then we felt like we did get the movie to work properly, but for most audiences, it never did. We had lots of people come to the finished version of the movie who didn't like it any more than the first version. AVC: Sundance turned you down, which was kind of a legendary snub. WA: Yeah, at the time, we were pretty worked up about it, but really in retrospect, I'm sure they just sat in a room and they were like, "Gosh, what is this?" Also, they were watching probably 75 movies a week at that point. AVC: Bottle Rocket went on to be named by Martin Scorsese as one of his 10 favorite movies of the '90s. WA: That was great. Yeah that was amazing, coming from one of my heroes. AVC: Were you surprised by the Wilson brothers' subsequent success in Hollywood? WA: No. I think when any of us look back, we think, "Gosh, we've been working in movies for quite a while, and this is the thing we've always wanted to do." I certainly feel lucky to have been able to do these movies so far. It seems like a great opportunity and a rare thing. But I did always think those guys, Owen and Luke, could be movie stars. It's not a shock to me that they are. I also think that Andrew Wilson, if I was going to make some kind of Bruckheimer movie or something, he could certainly be an action hero. I don't know if I'm very good at action, though. AVC: What about the big action sequence in The Life Aquatic? WA: That's my point. [Laughs.] I'm not exactly John Woo. AVC: You've become sort of a polarizing figure in film-buff circles, in that you have some people who are devoted to your work and others who absolutely can't stand what you do, and use you as an example of what's wrong with indie filmmaking. How do you react to that? WA: Well, it's a bit of a drag. I guess I try to insulate myself from it by not reading too much of that kind of material. It's not usually that great of an idea to read lots of reviews of your movies, because even if somebody's saying nice things, there'll still be something in there that pushes the wrong button, and it's not really that helpful. Having said that, I am aware of what you're talking about. [Laughs.] Even when we did Bottle Rocket, that was just exactly the experience the audience had with that movie. There were people who loved it, but there were lots of people who just hated it. I still don't understand why what I do tends to inspire those kinds of reactions. AVC: Last year there was an article complaining about racial stereotyping in your films, followed by another article defending your films for being so multicultural. It just seems strange that the kind of movies you make would be so hotly debated. WA: I know, where did that racism thing come from? That one I heard. It just seems so surreal to me. I couldn't have felt more misunderstood. AVC: What did you learn on Bottle Rocket that you were able to apply to Rushmore? WA: I remember when we were shooting Bottle Rocket that there were a couple of times when I thought, "I'm not sure exactly how to do this, so we're just going to do something and get through it." Then I remember on Rushmore thinking, "I am never going to approach a scene that way. I don't care if we've worked 18 hours and it's 5:30 in the morning and we have 45 minutes before the sun is going to come up and we've got to get this thing. I am going to make sure that we do everything we can to get it right. Because eventually the shoot is going to be over and we're just going to have what we have, and I'm going to have to live with it for the rest of my life." That's probably something that should be obvious, but it wasn't to me then. It's sort of revealed itself to me. AVC: And that's been your attitude ever since? WA: Yeah. Bottle Rocket wasn't a long, long shoot, but I do remember feeling a bit overwhelmed by it. It just seemed like, "There's so many shots!" Somewhere, halfway through the movie, it seemed like there was too much work to take on, and some things were hard to get right. I don't think I've felt like that since then. I think by the end of Bottle Rocket, I understood that these things have their shape, and part of that shape is that they end. AVC: Were you conscious making Bottle Rocket that it would be a calling card, an introduction, and that it needed to represent you? WA: We weren't really thinking about it being a stepping stone to anything, because the thing itself was just everything in the world to us then. That's all we were talking or thinking about, so there was no need to even think about it any other way. AVC: What are some of your favorite debut films? WA: What region should we start with? [Laughs.] Okay, France. One of my favorites is François Truffaut. His short film "Les Mistons," and then The 400 Blows. I think The 400 Blows is a great example of a movie that establishes such a strong point of view with something so personal, and that had an enormous effect on people. He evolved from there and became certainly a more skilled filmmaker, and made other movies that I like even more—that I love, even—but I don't think he ever made a movie that hit people the same way. I think "Les Mistons" has a lot in common with his later work, more than The 400 Blows does. But his first feature was the one that really made his reputation. Maybe that's not an uncommon thing, that somebody's first work is what establishes their identity. But who are other ones like that? Maybe you can lead me somewhere, because I feel like there's too many to choose from. AVC: Well, you've been to France, so how about England? WA: Oh, David Lean. The ones he did with Noël Coward—This Happy Breed, In Which We Serve, Blithe Spirit, Brief Encounter—and then those Dickens movies, Oliver Twist and Great Expectations. The early David Lean movies are quite different from those huge epics he ended up doing, but I think those are my favorites. Especially those two Dickens movies, which are simpler, and brisk and precise where Lawrence Of Arabia and Dr. Zhivago and The Bridge On The River Kwai all have to have an intermission. AVC: How about India? Your last film paid homage to Satyajit Ray. Pather Panchali was his first film, right? WA: Yeah, that was his first film. The Apu Trilogy was maybe three of his first four. Yeah, I love his movies. But the movies of his I love the most are some of the later ones. Ray's a peculiar one because his earliest films are what people sometimes refer to as "mature films," where the director's style is less immediately legible. His first films are quiet and gentle and very humane, and focused entirely on the characters. Some of his later films—some of the films he did in Calcutta in the '70s—are like Godard movies in that they're much wilder and experimental in a more aggressive way. They're very exciting. The Middleman and The Adversary and Company Limited—people sometimes call them his "Calcutta Trilogy," because they were made when Calcutta was in wild turmoil. That one in particular, Company Limited, is a great film. I suppose those aren't really seen, for some reason. AVC: Not sure they're available on DVD, at least not here in the States. WA: Well, you can get them if you got to Hindu-language places that deal mostly in Bollywood stuff, or in primarily Indian communities like in New Jersey or something. They'll be bootlegs, but they're there, with very bad subtitles, very bad translations… stuff that just doesn't even make any sense in the translations. AVC: Any Americans on your list? WA: Well a great first one is The Maltese Falcon, because John Huston wrote a great script for himself and then directed it perfectly. Scorsese had sort of a series of first films, like Who's That Knocking At My Door? and Boxcar Bertha, but his first real movie to me is Mean Streets, and that was a big inspiration for us when we were making Bottle Rocket. Roman Polanski has a great first film, Knife In The Water. Orson Welles did pretty well. [Laughs.] Peter Bogdanovich. Targets was a very good one, because that one was one of those movies where he was assigned one thing and he brought back something else. I think he was hired on to do a certain job, and instead he just did what he was interested in, and took the opportunity to make his own thing. And it's very good, that movie. Polly Platt worked on that with him. AVC: Could you have been that kind of filmmaker? Could you have been like a Bogdanovich or a Scorsese, who had to start off working within the studio system or even in the drive-in movie realm, trying to smuggle your own personal style into an assignment? WA: Well, I think I certainly would've been up for it. Before I had made any movies, if somebody had said, "You available to go film this? "—whatever it was, I would've said yes. I don't know whether I would've been any good at it. [Laughs.] But I certainly would've tried.